Everything Needed To Properly Care For Your: Denture Partial, Night Guard or Retainer. Contains ProTech® Concentrated Denture Cleaner, ProTech® Sonic Machine, and instructions. 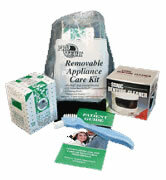 This special kit contains just about everything needed to properly care for any removable dental appliance. This is the same kit dispensed by hundreds of dentists nationwide. Now enjoy great savings and without a trip to the dental office it can be yours for personal use or as a wonderful gift idea.